What can I do with the mobile catalog? A mobile-friendly version of WCCLS Catalog is available at m.wccls.org. The mobile catalog allows you to do many of the things you do on the regular WCCLS catalog, but on a site optimized for a mobile device like a smartphone or tablet. View video demonstrations. How can I access the mobile catalog? Using the browser on your mobile device, visit m.wccls.org. You can make a shortcut on your device's home screen to keep the WCCLS Mobile handy, like an app. If you're not sure how, search the Internet for instructions on how to add a mobile shortcut to your device. 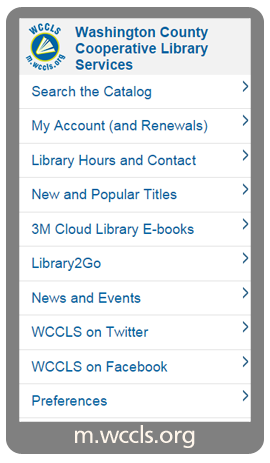 To access the full version of the catalog/account on your mobile device, go to the bottom of WCCLS Mobile. In the footer, you'll see a link called Full Catalog which you can click on to use the full version on your mobile device. Why is the WCCLS mobile catalog not an app? We chose to make WCCLS Mobile available in an internet browser for a number of reasons. To ensure the widest levels of access to the service. The mobile catalog is neither device- nor operating system-specific. To save the time and money required to develop multiple apps for specific mobile platforms. Some areas of Washington County do not have access to high-speed internet. We hope the streamlined nature of WCCLS Mobile will be of benefit to people without a fast connection.